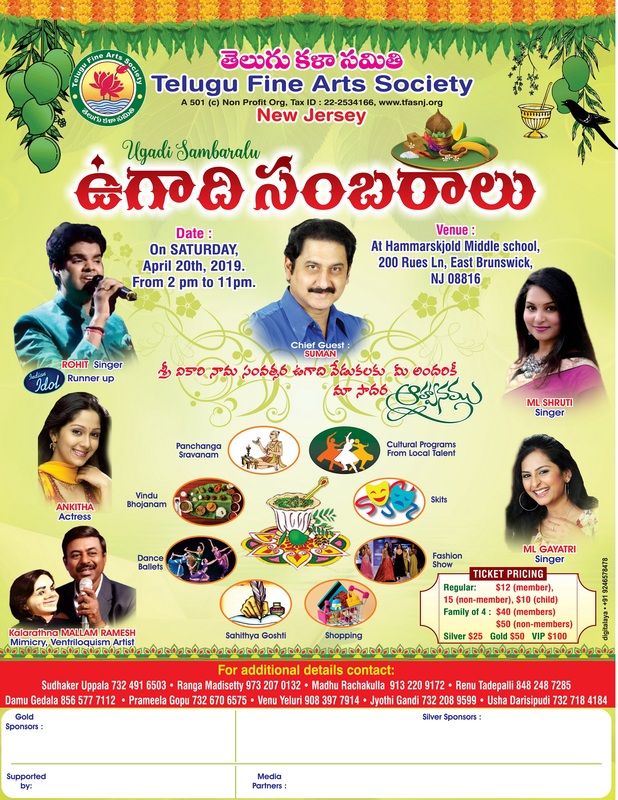 TFAS is a non profit organization serving the Telugu community in NJ & Tri-state area. TFAS gives you a platform to expose your talent----members get the priority. You may organize, coordinate or participate in our cultural programs. TFAS gives your children an opportunity to expose their talent & learn Telugu culture. Member's children are preferred participants. TFAS protects & supports its members in need of help. Ex: Medical or Legal emergencies. We offer organizational representation from the community. TFAS members get special admission rates for annual functions (Ugadi & Diwali). You meet new and established people during our functions to share experiences. TFAS members receive Telugu Jyothi - our literary magazine is for members only. TFAS life members get free matrimonial ads in TJ. Members send articles for TJ. TFAS promotes networking among Telugus. We keep you updated with all local and community events and news via regular and Email. TFAS helps forming & promoting special interest groups. Ex: Saraswatha Samooham promotes Telugu literature in tri-state area. Many people living in the New Jersey State are now readily familiar with the acronym TFAS which stands for Telugu Fine Arts Society. Since its inception in 1984 TFAS has grown into an organization working with a holistic approach of bringing all Telugu speaking people of the area under a common roof to cater to their cultural, social and literary needs. TFAS comprises of a board of nine trustees as Executive committee who serve for a term of Two years to achieve the goals of the organization. In a nutshell it caters to the cultural, social and literary needs of the Telugu people migrated from India .It works to imbibe the same into their children who are raised here in USA. TFAS celebrates all the major annual Telugu festivals such as Sankranti, Ugadi and Deepavali. TFAS Strongly encourages participation by members as well as all the interested individuals and families living in the area. Other social events include annual picnic during summer, organizing special cultural events and music concerts by distinguished artists from India. Perpetuate Telugu culture, literature, traditions, and values; integrating them into modern life by publicizing Telugu related cultural events. Organize and promote literary, cultural, educational, social, and community activities of the Telugu people living in the area. Solicit, raise, and disburse funds for charitable, cultural, religious and educational activities directly or in cooperation with other non-profit organizations. Raise funds for natural disasters either directly or in cooperation with other non-profit organizations. Promote the understanding of Telugu literature, art, culture, music, dance, and drama among the children of Telugu speaking people.